Take a look at this magnificent contemporary style basement renovation project with playroom in Ahuntsic. You too can benefit from our experience as a general contractor specializing in bathroom renovations and our turnkey renovation service. Call us for a free consultation! 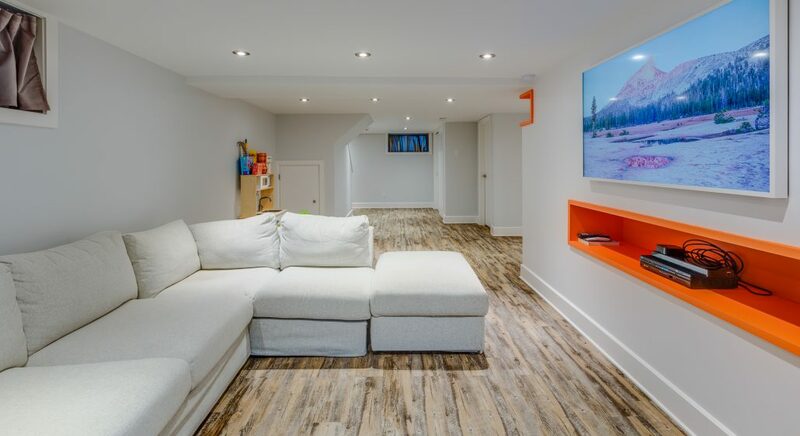 We have been approached by clients who want to adapt their basement for a family with young children. After conceptualizing the project with our designers, the first task was to partially demolish the existing basement to achieve our customers’ vision. 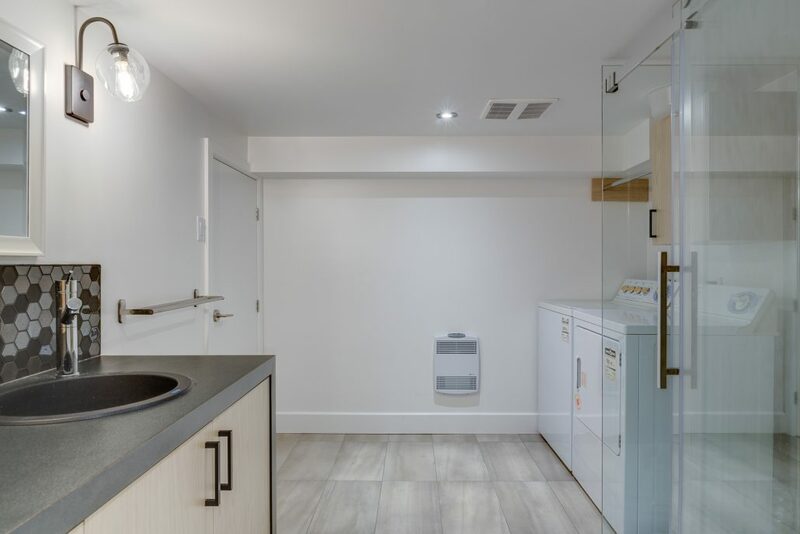 The challenge was even greater with the addition of a brand new bathroom with space for laundry in the basement. 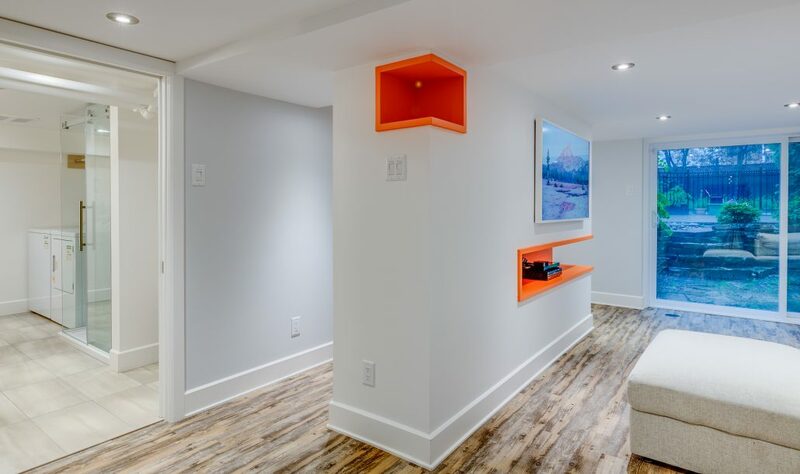 Our team quickly got to work to create a warm and practical basement with a few touches of contrasting colors. First, we completely removed the original linoleum floor and added a beautiful barn wood style hardwood floor. 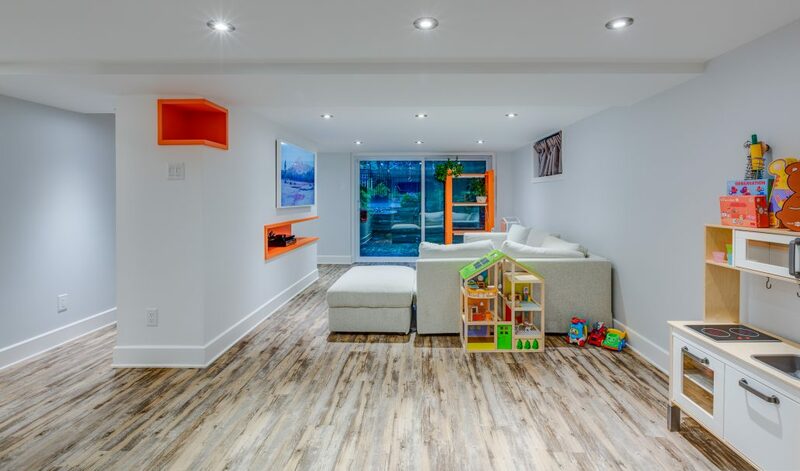 We opened the space by tearing down one of the walls to create a living room and playroom area for children with built-in shelves in a contrasting color. 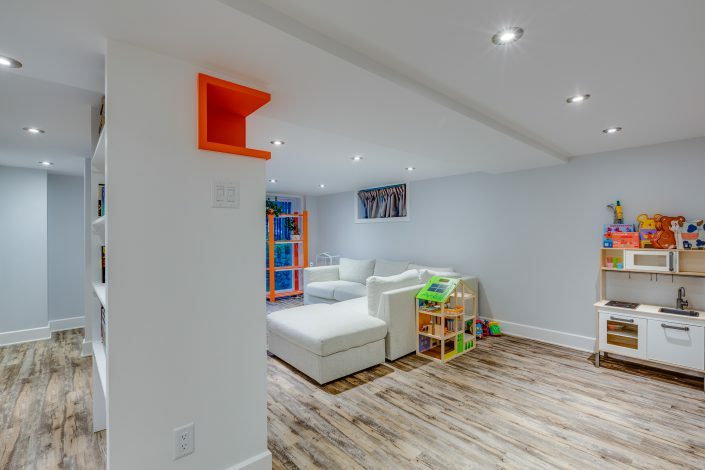 The walls were painted light grey throughout the basement, except for the bathroom, which was painted white. We have also added white painted wooden moldings for a more classic touch. We also refurbished part of the lighting to maximize the warmth of the basement. 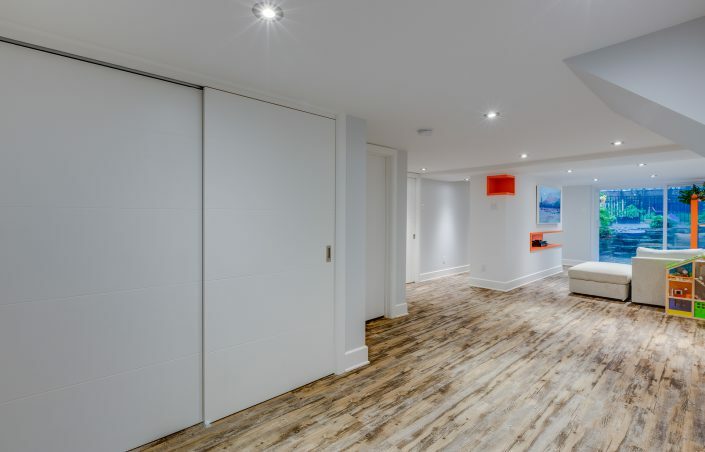 Our customers also wanted to integrate a new bathroom into their new basement. We started by replacing the linoleum floor with an elegant ceramic floor. 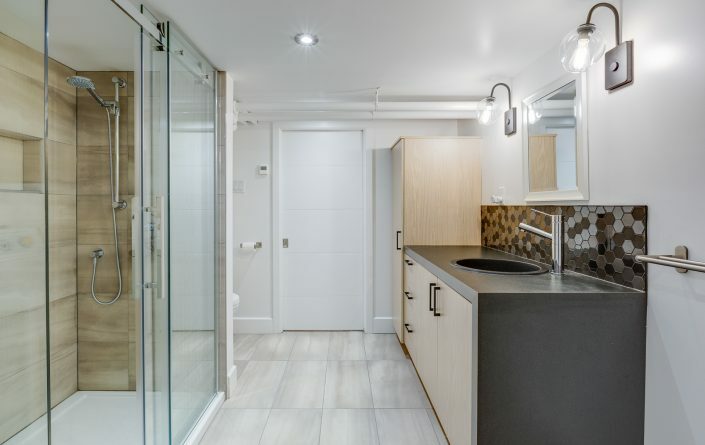 We chose a built-in shower with telephone shower with ceramic walls. 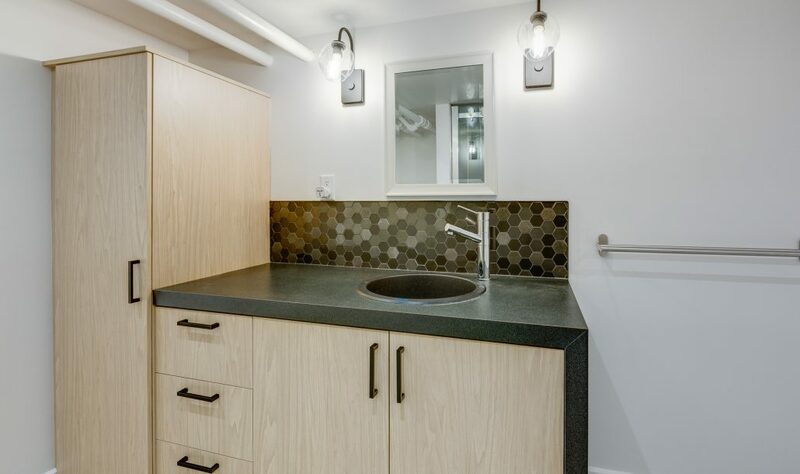 Our customers have been fortunate to have custom bathroom cabinets and bathroom vanity designed to meet their needs. We have also created a space for the washer and dryer so that they do not clutter the bathroom. 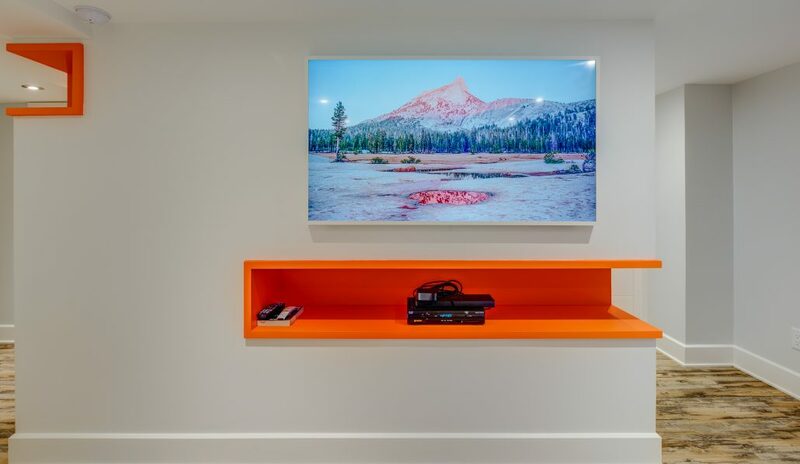 As a general contractor in residential renovation, we have established lasting partnerships with painters, electricians, custom cabinet makers, cabinet makers and many more, in order to adequately meet our clients’ needs. 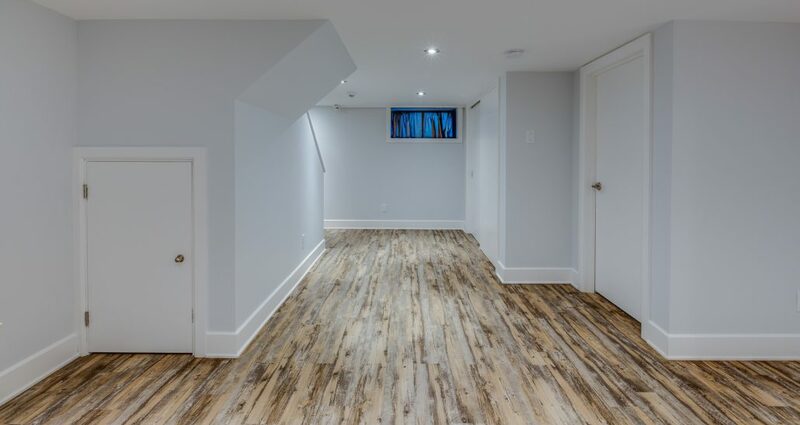 If you would like more details about this basement renovation project in Ahuntsic, our turnkey bathroom renovation services, our prices, or our services, we invite you to contact us by email or phone. Your first consultation is free of charge! Our team will be happy to welcome you and answer your questions.